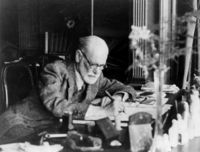 Freud passed away on September 23, 1939, at the age of 83. Freud died of oral cancer. Freud was a heavy smoker with a 20-cigar/day habit. ↑ 1.0 1.1 McGrath, Alister (February 28, 2005). "The twilight of atheism". Christianity Today website. Retrieved on May 23, 2015.